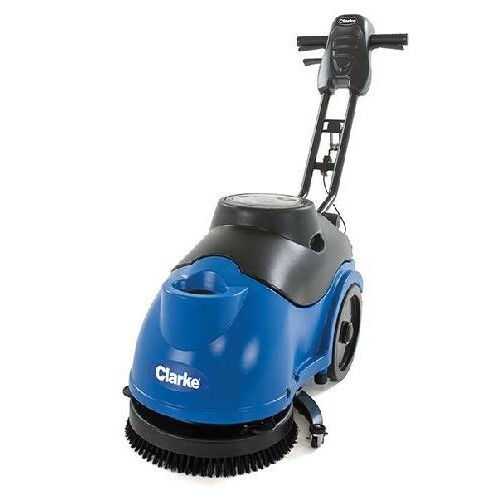 Experience convenient, intuitive scrubbing with the pad-assisted Clarke MA50 15B Walk-Behind Scrubber. Complete with a 15 inch cleaning path, an on-board battery lasting up to 2 hours and 3.5 gallon solution and recovery tanks. These convenient features equate to cleaning productivity of up to 8,000 square feet per hour. In addition, the MA50 15Bs curved squeegee helps pick up more solution and a low-profile, pull-down handle comes in handy for tight cleaning jobs and storage.